Build a pitch presentation for Avis car Luxury rental, showcasing the end to end targeted marketing services our agency provides. As the sole UX designer on the team, my role was to showcase the new dynamic content generating tools we had and illustrate how this could benefit Avis. Create a series of dynamic landing pages, generating bespoke content for each user, based on their journey (i.e. which advertisement they saw or what car/destination they were looking for). I built a content matrix based on research, Google analytic and the clients’ key car rental categories. The matrix includes: - Location images - Car groups - Car types within these groups (images) - Three title variations focusing on: - Factual, emotional and beneficial titles - Incentive - Sample images of cars and locations. I then designed 'layered' responsive wireframes, which allow for easy change of copy and images, keeping the same layout and hierarchy of information. 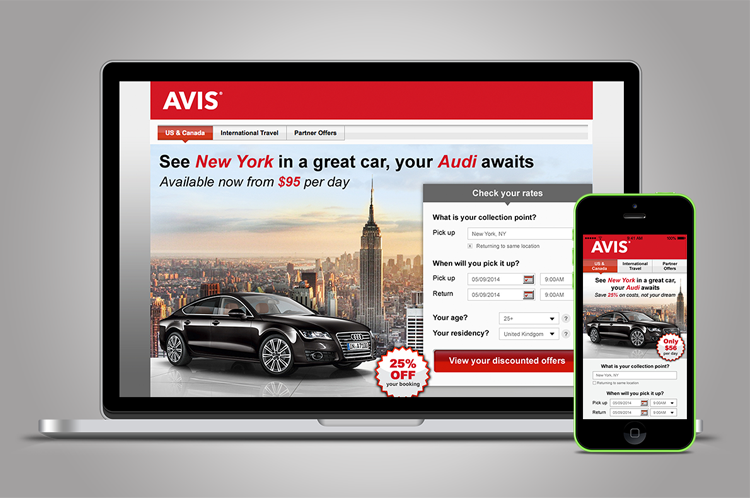 Avis was impressed with our marketing abilities and have signed a contract with the agency.